When attempting to host a game you receive a message saying “A game by that name already exists!” no matter what game name you use. This happens when your account has had its gaming privileges revoked. In most cases this is a result of accounts & passwords being stolen from War2.me in 2015. 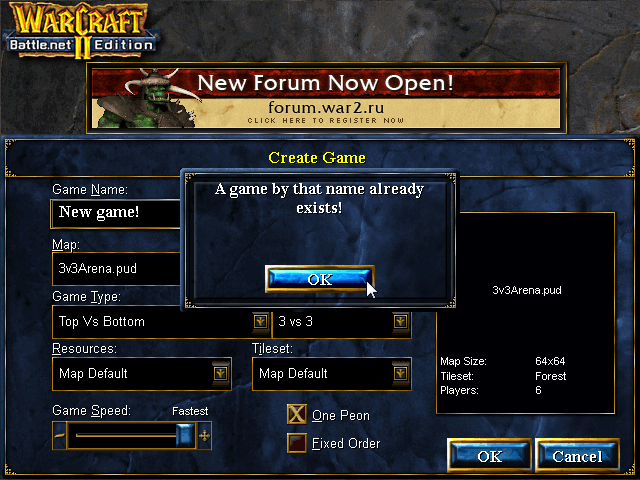 In order to prevent abuse of accounts that used the same password on both servers all affected accounts were “gamelocked” on War2.ru, which means they can’t join or host games but can still connect to the server and chat in the lobby. The solution is to update your account password and contact an admin to have the gaming lock removed.